I’m never sure whether I like Lauraine’s books or not…and I think I’ve read all of them but her Return to Red River series. Obviously, since I’ve read so many, there must be something that draws me to them (Blessing in Disguise was my favorite book, because it felt different than all of her other books). The stories are fine, but that’s about it. I never find them overly exciting or something that I can hardly put down. Cassie’s story in Valley of Dreams was much the same. The story just plods along, with no outstanding characters or situations to keep me riveted. Cassie parents owned a Wild West show, into which she was born and raised. Cassie is the star sharpshooter in this traveling caravan, the only life she has ever known. 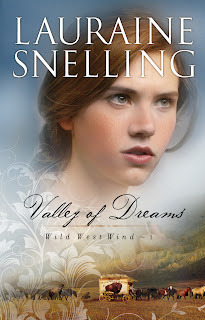 After her parents die and her ‘Uncle’ disbands the show, Cassie feels her only choice is to try and find the ‘Valley of Dreams’ her father always talked of. A Lasting Impression by Tamera Alexander and TWO Giveaways! Here's another chance for you to learn about Tamera Alexander's newest book, A Lasting Impression. I'm also letting you in on Tamera's Kindle Fire Giveaway....and, my own giveaway for my extra copy of A Lasting Impression! A fake. A forger. More than anything, Claire Laurent longs for the chance to live an authentic life, to become the woman she wants to be. And she'll be given that choice. But will it come at too costly a price? You can read even more about A Lasting Impression HERE. I couldn't understand why two copies of A Lasting Impression showed up in my mailbox, only days apart. I searched my emails and finally figured it out. After (how many?!) years of reviewing books and keeping schedules for tours straight, I finally goofed...and signed up to review this book through two different groups! So, today, CFBA introduces A Lasting Impression by Tamera Alexander.